Yves Saint Laurent (YSL) lipsticks have been the talk of the town since Jun Ji-hyun was mistakenly believed to have been wearing their lipsticks in My Love from the Star. 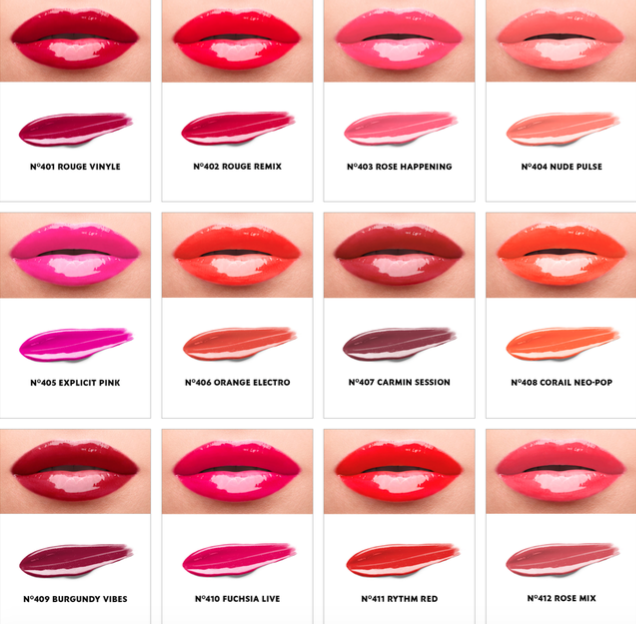 In fact, if you type YSL into a Google search bar, one of the first results you get is ‘YSL lipstick’. Vinyl melts into cream, drenching lips in moisturizing comfort and a riff of fearless colour. Smoothing, hydrating, perfecting in a flash. Creamy vinyl shine wraps around every contour, unleashing flawlessly enveloped lips, in 12 powerful shades. The first creamy stain by YSL beauté. Vinylized shine and ultra-pigmented colours that last with comfort. Cream hydration for 10 hours. * Nourished and smoother lips day after day. The shade I got was 401 Rouge Vinyl, a deep wine red. I like how the product smells – when you open it, there’s a distinctive sweet, cherry scent that doesn’t smell too sickly. On first application, you can already see how good the colour payoff and incredibly moisturizing this is. So this is what happened when I tried to clean it off… this product obviously stains very, extremely well. I tried to rub off the stain as hard as I could (in fact, you can tell that I rubbed so hard that the surrounding skin has turned red), but to no avail. This hardly happens to me (with the exception of really good lip tints like Innisfree Eco Flower Tint) When I resorted to using makeup remover wipes, it got most of the stain off but there were still traces of it. I don’t think I’ve been so thoroughly impressed by a lip product’s staining power before. I put it to the test by wearing it for a long day and seeing if I need to reapply at all throughout the day. As expected, I never once had to reapply. It lasted me for almost 12 hours straight, all the way through lunch, a presentation, and dinner. It felt very comfortable on my lips as well, in fact, better than Urban Decay’s Vice Liquid Lipstick. 401 is not my go-to shade, but I love this product so much that even a red like this can work for me. What I try to do is to make a gradient lip look instead of fully covering the lips, so that it doesn’t look too intense. I think 401 is a very classic YSL shade, suitable for any occasion, including work and parties. Unfortunately, $51 is pretty much out of my budget. I think the price tag is reasonable if you consider YSL’s brand power and actual effectiveness, but I don’t think I will be buying this anytime soon.